The Oase Skimmer 250 LM is a high-performance floating skimmer that keeps up to 250 m² of surface water clean. The floating skimmer is particularly well suited for bodies of water with significant water level fluctuation, and it can be flexibly implemented where pollutants accumulate. The system takes up pollutants via a skimmer flap that is 52 cm in width. 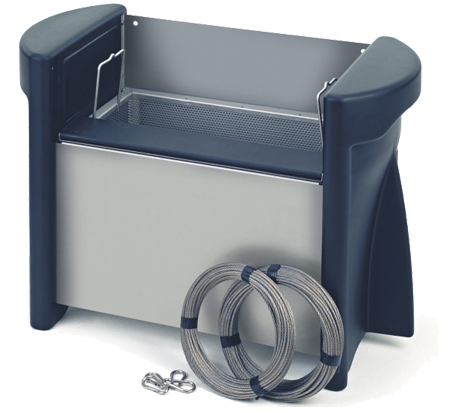 Pollutants are gathered into an easy-to-remove collection basket for convenient disposal. The integrated, energy-efficient circulation pump ensures powerful skimming and generates ideal water flow thanks to focused water return. Leaves, pollen, and particles deposited on the water surface by wind are a risk to the biological equilibrium in a body of water. OASE skimmers powerfully and effectively pull these pollutant particles off of the surface and into the collection basket. Thus pollutants can be removed from the eco system of the body of water before they harm the eco system. Extremely long service life due to canned motor technology without seals that are subject to wear.